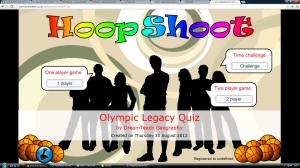 This basketball style game is a 1 or 2 player quiz, with questions about the Olympic legacy. There is also a time challenge game. Ideal for ending a lesson or recapping a previous lesson. 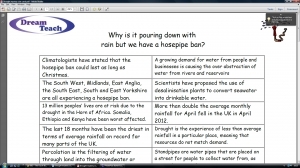 These clue cards and follow up questions ask pupils to consider the reasons for hosepipe bans at a time when precipitation has been double the monthly average. 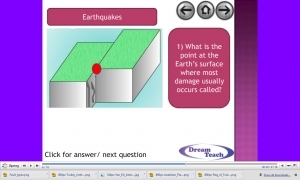 This 10 question quiz accompanies the earthquake presentation. 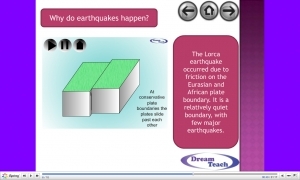 Some prior knowledge of tectonics would help the pupils. This presentation focuses on the 7.2 magnitude quake which struck Van, Turkey on the 23rd October. 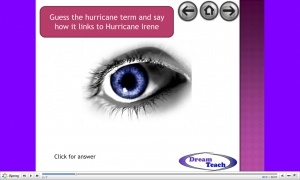 This starter will get pupils thinking about hurricanes and the study area prior to looking at the Hurricane Irene presentation. In this resource, pupils need to choose squares on the screen. They need to try and guess what the image is behind the squares. It is a good starter, prior to looking at Hurricane Irene. This presentation looks at the recent hurricane in the Caribbean and North America, in addition to tropical revolving storms in general. 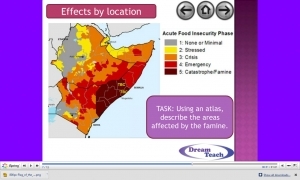 This presentation looks at the cause and issues surrounding the summer famine in the Horn of Africa. We have updated the 2011 US tornadoes presentation to include footage of the Joplin tornado. There is also an alternative link to the BBC website if YouTube is blocked in your school and the video doesn't run. This presentation looks at the recent Lorca earthquake. It would work well if used in comparison to the Haiti, New Zealand or Japan earthquakes. This presentation focuses on the tornadoes in the USA in April 2011. This record month for tornadoes has cost over 340 lives already. 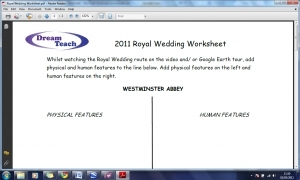 To complete this worksheet pupils need to watch the Royal Wedding route video (click here to access) and/ or the Google Earth tour. Pupils then annotate the line with physical and human features for the route, before moving onto the questions/ extension.. 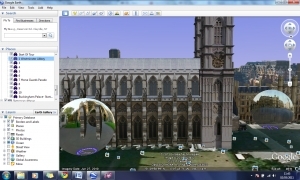 This Google Earth tour accompanies the worksheet. It can either be played by clicking the play button in the menu on the left (just underneath the tour), or by double clicking each of the points in the route. It will work best if 3D buildings are enabled.. 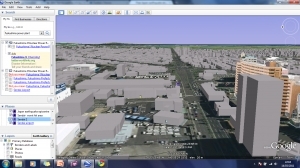 This is a Google Earth tour, looking at key places in the events of the earthquake and tsunami. To play the Google Earth tour, click the link. When Google Earth has loaded, click the play icon half way up the screen on the left hand side (bottom.. These are interactive activities for pupils to use. There are three pages in total although the next button will not work until the activity has been attempted. The mark and feedback buttons both give pupils an idea of how they have performed. .. This worksheet accompanies the New Zealand 2011 presentation. 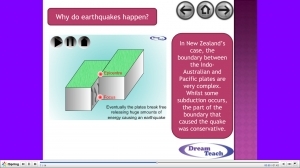 This presentation looks at the cause, effects and rescue for the 2011 New Zealand earthquake. There is also an accompanying worksheet. 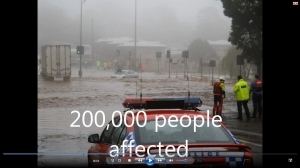 This movie follows on from the previous resources about the Queensland floods. There are several images showing the threat to Brisbane. To play full screen, click on the tab in the bottom right hand corner of the screen. In this starter game, pupils need to type in the definition or answer before the 30 seconds is up! 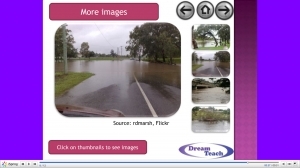 This presentation gets pupils thinking about the causes and effects of the flooding in Queensland, Australia. It has some interactive elements and some more traditional tasks. This presentation looks at the recent Mt Merapi eruptions, looking at the cause, volcanoes in general and the events that have led to loss of life and homes. 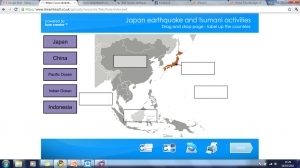 This presentation looks at the recent earthquake in Indonesia and the resultant tsunami. It also looks back at the 2004 Boxing Day tsunami and the potential eruption of Mount Merapi. This presentation gives pupils a good set of images to watch to music, highlighting the damaged caused by the Canterbury earthquake. It has several tasks and finishes by comparing earthquake to the Haiti earthquake, earlier in 2010. This presentation looks at the devastating floods which have affected Pakistan in July and August 2010. It gives some background information about Pakistan, before looking at the cause and effects of the flooding. This movie introduces the explosion and subsequent oil spill off the coast of the USA. Click the tab in the bottom right corner for full screen. 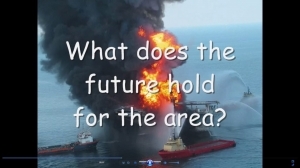 This presentation provides information about the explosion and subsequent oil spill off the coast of the USA. 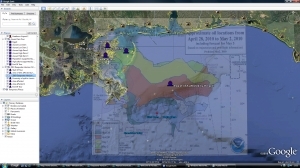 This Google Earth tour looks at the impact on the Louisiana coastline using a photo overlay. When Google Earth has loaded, click the play icon half way up the screen on the left hand side (bottom right corner of the places box). It works best with 3D.. This presentation takes a look at the causes and effects of the Eyjafjallajoekull ash cloud. There are some pupil tasks included within the presentation.